This is a phrase we hear a lot. When I first heard the song by Ryan Shupe and the Rubberband I immediately fell in love with it. 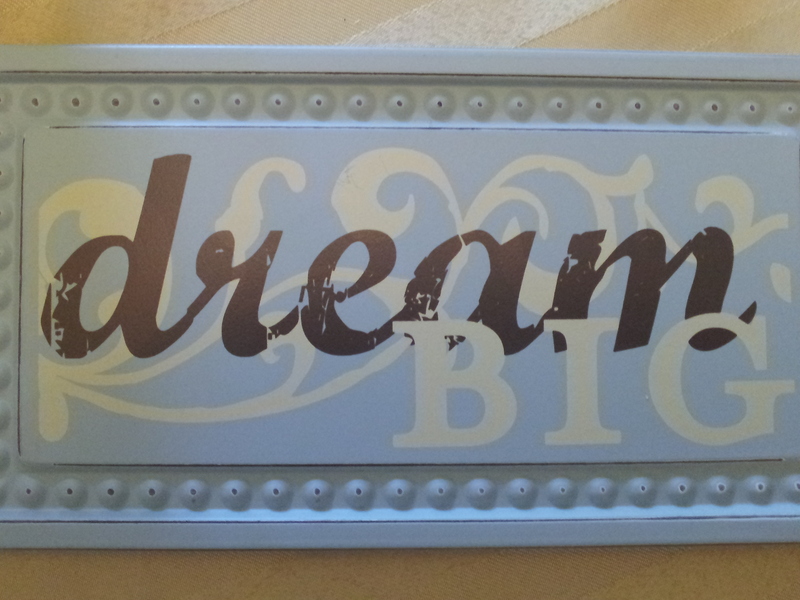 So seeing this plaque while I was shopping with my mom I knew it was coming home with me. My mom on seeing the plaque said to me, “Sharon, do you dream big?” Looking at her I nodded and replied I did. As we continued our way around the store what she had asked me still was in my head. Do I dream big? I have been a dreamer for most of my life. My imagination has always been without borders as I wondered, plotted and tried to figure out how to accomplish what was going on between my two ears. My first dream big was to go to a four year school of higher learning. I would be the first in my family and I was determined to not fail. Even when I changed my major in my Junior year I still graduated on time at the top of my department, Chemistry and Physics. But when that day came what was left? Finding work and getting married seemed to be what we did at least in the time frame I was at. When my future mother law had said ,” Sharon don’t make me a grandmother before a mother in law,” I told her my only goal at that moment was to graduate. Getting married and having a child was another dream, one that came and went pretty quickly. My life started to have a routine about it. There is nothing wrong with routine. It keeps me stable and focused. Yet when my mom asked me that questioned I wondered when was the last time I dreamt big and the first answer that came to my mind was my writing. 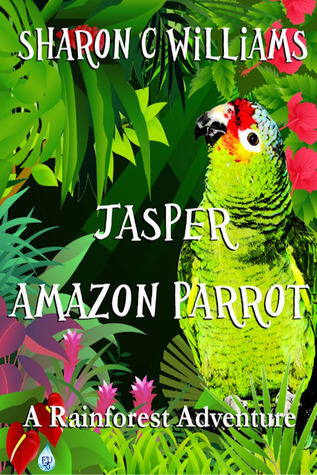 I started writing Jasper:Amazon Parrot in the Fall of 2009. I completed it in a few months and have done so many revisions and edits if one saw the first draft to where it is at now you would recognize the name Jasper and that is about it. Prior to that time I had never thought of myself as a writer in any form. A good friend Debbie told me that my husband had told her he felt I wrote well. When she told me that the wheels started to turn in my head. That summer is when the thoughts and words came of how to start this book. I am not sure what was the umph that made me get started but I did and have not turned back. This is my dream big project and it has been with me for a few years now. I don’t think of the business as being hard, which we know it is. I don’t think of the many people who have told me this can’t be done. I don’t think of all the negatives that can come in one’s way when one tries to get a book published. My sole thought is why the hell not? Seriously what do I have to lose? My back up thought had always been if worse come to worse I can make it into a book and read it to my grandchildren the series that I have in mind of writing. So with that I am pushing forward with this book and others that have been written since the late months of 2009. This is my dream big. It has been a rocky ride but I am up to the task. I don’t have a back up dream big plan at the moment, I am too busy trying to make this one a reality. ‘Cause when you dream it might just come true. Honored to be in your circle of dreamers.